After spending perhaps up to one year in Antioch following his Second Missionary Journey, Paul sets out from Antioch to embark on his Third Journey. His first destinations will be the congregations he planted in Galatia on his First Journey. Paul briefly visits the congregations he started in the regions of Galatia and Phrygia to strengthen the believers on his way through the interior of Asia to Ephesus. Arriving at Ephesus, Paul finds and instructs some believers about baptism. According to his usual custom, he goes regularly to the synagogue and preaches Jesus as the Messiah for three months until the Jews there refuse to believe. For two years, Paul has daily discussions in the lecture hall of Tyrannus, which effectively spreads the Word of God throughout the province of Asia. Throughout Paul’s time in Ephesus, God did extraordinary things through Paul so that the name of Jesus was highly regarded in the whole region. After spending about 3 years in Ephesus, a silversmith who is worried about the loss of business in crafting idols begins a riot in the whole city concerning the Christian message Paul is preaching. After the city clerk convinces the rioters to disassemble, Paul says goodbye to the believers and sets out for Macedonia. Paul travels to Macedonia in order to visit and encourage the congregations he planted on the 2nd Journey. At some point during his trip through Macedonia, Paul writes another letter to the believers in Corinth, the letter we know as 2 Corinthians. Eventually, Paul makes his way through Macedonia down to Corinth in Greece. Paul makes it down to Corinth in Greece, where he stays for three months and writes his famous letter to the Romans. 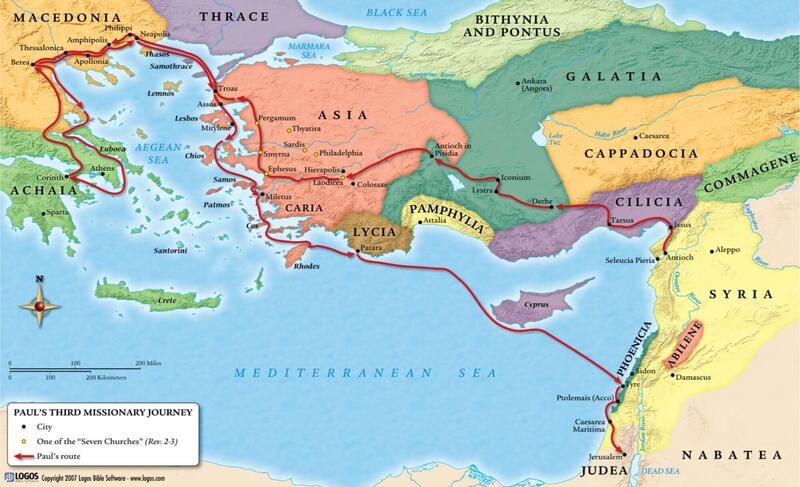 Hearing about a plot by opposing Jews, he decides to travel back up north through Macedonia to Philippi. After traveling back up north through Macedonia, Paul and his companions arrive at Philippi. Many of his companions travel ahead of him to Troas, and after celebrating the Jewish Festival of Unleavened Bread he and Luke set sail for Troas to meet the others. While in Troas, one night Paul speaks to the people for many hours. A young man named Eutychus is seated in a window and falls asleep listening to Paul, causing him to fall backward out of the third story window. He is picked up dead. Paul goes down and throws himself on top of Eutychus, which brings the young man back to life. Staying in Troas for seven days, Paul and his companions leave for Assos with their eyes toward their final destination, Jerusalem. Eventually sailing to Miletus, Paul sends for the Ephesian elders to meet him. After they arrive, he delivers an emotional farewell speech to warn them against false teaching and to encourage them in their faithful work as shepherds for God’s kingdom. After praying with them and saying goodbye, Paul and his traveling companions leave for Kos on their way to Tyre and eventually Jerusalem. Sailing along the major coastal towns of Phoenicia, Paul and his companions arrive at Caesarea where they stay at the house of Philip the evangelist. After a number of days, a prophet named Agabus comes to Paul, takes his belt, ties his own hands with it, and prophesies through the Holy Spirit that in the same way Paul will be bound and arrested in Jerusalem by the Jewish leaders. Paul states that he is ready to be arrested and even die for the Lord Jesus, so he is going to Jerusalem anyway. Paul finally arrives in Jerusalem, officially ending his 3rd Missionary Journey. Since he had spent 3 years in the city of Ephesus, this whole journey must have lasted 4 or 5 years, from roughly 53 AD to 58 AD. Following his arrival in Jerusalem, Paul is arrested and jailed for two years, eventually being sent to Rome as a prisoner. The book of Acts ends with Paul as a prisoner in Rome for two years, but evidence from later letters suggests he was released, conducted a fourth missionary journey, and later was arrested again. Church tradition states that Paul was executed by Nero sometime between 64 and 67 AD.